Ancient Welsh bardic texts tell us that in early days the spiritual integrity of Britain was maintained by perpetual choirs. Teams of monks sang perpetually on a rotation basis at Llantwit Major, Glastonbury and Stonehenge to heal and harmonise the land. These sites are positioned on 3 vertices of a regular decagon, a web of 10 ley lines extending from a central point at the place where 3 counties meet: Herefordshire, Gloucestershire and Wocestershire. At the centre of this decagon is the White-leaved Oak. It is a gnarled old tree with a diameter of 2 meters and is thought to have been planted to replace the original tree, the hub of the wheel. To this day people visit the tree and leave offerings. Perhaps this gives us some hint of the importance of the oak tree in Britain. Oak is a symbol of home, sovereignty and security. One of the most common and useful in our once extensive woodlands, it has been called the father of all trees and is especially generous, giving strength and support, sustenance and shelter. Its majestic and noble presence is at the same time good-humoured and welcoming and it personifies a spirit of warmth, honesty and friendliness. It’s image has come to represent all that is good and fine. A kingdom unto itself. It offers its hospitality to all, providing habitat for over 500 species of invertebrates, birds and animals as well as hosting mosses, lichens, ferns and vines and it is the largest and longest lived of all our native trees, sometimes reaching up to 700 years old. 300 years to mature, 300 years as a mature tree and 300 years to decay. It begins to produce fruit at 60 years old and may reach heights of up to 130 feet with girths in some individuals as much as 36 feet. It has deeply furrowed bark and distinctive lobed leaves and acorns. In autumn the ripened acorns of the oak feed pigs/boar, deer, squirrels, doormice and even man. 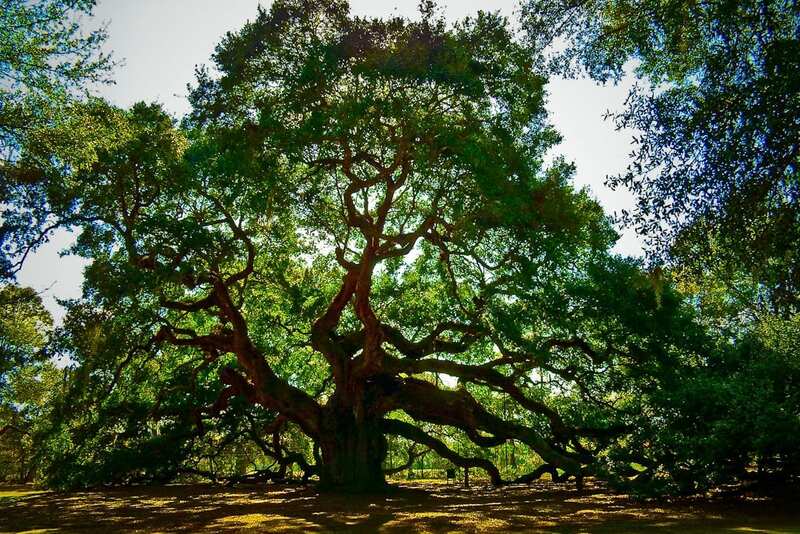 The Greeks believed that the oaks were the first trees created and that humankind sprang from them, their acorns providing us with our first food. At one point woodlands were measured in pannage; the number of animals that could be grazed there. ‘Fed with oaken mast the aged trees themselves in age surpassed.’ Indeed, excavations in the Ouse valley have revealed 5 successive forests, the earliest being 70,000 years old. Oak has been extensively used for building ships and houses. The beauty of its grain and rich colour have made it a favourite for making furniture, and doors made of oak give a particularly strong sense of warmth and security. Its roots have been used for the hafts of knives and daggers and its twisted ‘knees and elbows’ were most highly prized by shipbuilders. It also has many medicinal and magical properties. Its astringent/antiseptic bark can be made into a decoction and drunk as a tonic which is especially good for inflammation of the throat. Merely by bathing your feet in this decoction you can be sure to find the right path in life and an acorn when carried brings protection, luck and health. The Celtic Druids were particularly attuned to the power of trees and the oak was especially revered. They believed that the oak was the embodiment of godhead in nature and being the most frequently struck by lightening, a medium through which the will of the gods could be interpreted. The tree was considered even more sacred where mistletoe—associated with male procreative force and named ‘all heal’— was present. They associated oak with sky and thunder gods and with goddesses of fire and fertility. It represented the sun and was present at all the solar festivals, especially the summer solstice when the sun is at its height. Great oak fires would blaze in celebration and it was at this point that the power was passed to the Holly King who presides over the dark part of the year up until the Winter solstice when once more the Oak King/sun reigns. So in this association we see the profound significance of oak as the sun and therefore cauldron of plenty. Unblemished lord) of the Rebirth of the world. There are many mythological associations. Merlin is said to have worked enchantments in groves of oaks using the topmost branch as his wand. In Caerfyrddin/Carmarthen a great oak named Merlin’s Oak stood and it was foretold that ‘when Merlin’s Oak shall tumble down, then will fall Carmarthen town.’ Gwyn ap Nudd; the wild huntsman, inhabits ancient oak woods and Llew Llaw Gyffes in the Fourth Branch of the Mabinogion is regenerated at the top of an otherworldly oak tree. Kings Arthur’s table is said to have been fashioned from a single slice of an enormous oak tree and his coffin was carved from an oak tree. Another hero of the people, Robin Hood lived among the oaks of Sherwood forest and held meetings in the great hollow of a particularly old oak tree which still stands to this day and is known as the Major Oak. It is 64 feet in girth and can hold 34 children inside! We are fortunate to have an area of extremely healthy ancient woodland at Bwlch Corog. These magnificent, predominantly sessile oaks, some of which are veteran trees, are a rarity in the Welsh landscape and add much to the ecology and beauty of the site. We have collected acorns from these trees and plan to plant out saplings in the coming years. Who knows what animals will be foraging the acorns from these saplings when they mature?